Ventilator associated pneumonia in Egyptian critically ill preterm and full term neonates. Pneumonia is an important cause of neonatal infection and accounts for significant morbidity and mortality, especially in developing countries [1,2]. Neonatal pneumonia may be classified as early onset (within the first 3 days of life, mostly within 48 hours), or late onset (from 4 till 28 days of life). Congenital or intrauterine pneumonia which is a variant of early onset pneumonia either acquired by trans-placental spread or from aspiration of infected amniotic fluid after prolonged premature rupture of membranes (PROM) or during delivery . Late onset pneumonia is nosocomial infection . Pneumonia mortality risk is strongly dependent on birth weight and age of onset. Case fatality rates are much higher for intrauterine or early onset pneumonia than for late on set neonatal pneumonia [4,5] and higher among low birth weight newborns . VAP occurs in patients receiving mechanical ventilation through an endotracheal or tracheostomy tube within 48 hours [7,8]. Difficulties in diagnosis of VAP have led to the development of many diagnostic techniques such as blood culture, bronchoalveolar lavage, protected specimen brush and quantitative endotracheal aspirates. The gold standard for diagnosis of VAP is lung biopsy; however it is an invasive procedure . Risk factors for VAP include prematurity, very low birth weight, severe underlying disease, prolonged duration of mechanical ventilation, use of wide spectrum empirical antibiotics, prolonged hospital stay, inadequate pulmonary care, extensive use of invasive devices and procedures, and increased number of re-intubation . To find out the prevalence, risk factors, causative microorganisms and outcome of VAP in preterm and full term neonates admitted to NICU of TUH and BUH in Egypt. Included 60 preterm neonates, their weight ranged from 0.9 to 2.5 kg, gestational age <37 weeks. This group was sub classified into Group 1a (Early onset VAP in preterm neonates): included 30 preterm neonates who acquired VAP in the first 3 days of age and Group 1b (Late onset VAP in preterm neonates): included 30 preterm neonate who acquired VAP after the first 3 days of age. Included 60 full term neonate, their weight ranged from 2.6 to 4.3 kg, gestational age ≥ 37 weeks. This group was then sub classified into two group Group 2a (Early onset VAP in full term neonates): included 30 full term neonates who were acquired VAP in the first 3 days of age and Group 2b (Late onset in full term neonates): included 30 full term neonate who acquired VAP after age of 3 days. Group 3 (Control group): Included 30 neonates of age ranged from 0 to 28 days, their weight ranged from 2.5 to 4 kg, gestational age from 38 to 42 weeks admitted to NICU due to various illness not received mechanical ventilation. All neonates on MV for more than 48 hours provided that they had no clinical, laboratory or radiological manifestations of pneumonia at the time of initiation of MV. Neonates who required MV for less than 48 hours, who had pneumonia at the time of initiation of MV, meconium aspiration syndrome (MAS), pulmonary edema or congenital anomalies of the lung. High oxygenation requirement (FIO2 >0.85), pneumothorax, bradycardia (heart rate <80 beats/min), hypotension or thrombocytopenia (platelet count <30,000/mm3). Centers for Disease Control and Prevention (CDC) has recommended the following criteria for diagnosis of VAP in neonates and infants under one year of age: Patients who are mechanically ventilated for more than or equal to 48 hours with worsening of gas exchange (O2 desaturations, pulse oximetry <94%, increased oxygen requirements or increased ventilator demand) and at least three of the following symptoms and signs: Temperature instability (Rectal temperature >38°C or <35.5°C), apnea, tachypnea, nasal flaring with retraction of chest wall, grunting, wheezing, rales, rhonchi, cough, bradycardia (<100 beats/min) or tachycardia (>170 beats/min), new onset of purulent sputum, change in character of sputum, increased respiratory secretions, increased suctioning requirements, leukopenia (<4,000 WBC/mm3), leukocytosis (>15,000 WBC/ mm3), left shift (>10% band), more than ten leucocytes in Gramstain of tracheal aspirate (in high power field), positive culture from endotracheal aspirate or radiologically new, persistent or progressive infiltrate . As we selected neonates from 2 large university referral hospitals, we see very large numbers of neonates who met inclusion criteria but we intended to select only 120 neonates (40 for each group) to be included in our study who for proper comparison using statistical analysis. 1. History taking (personal data, perinatal history, present history, and duration of hospital stay)and clinical examination (Gestational age estimation, Vital signs including temperature, heart rate, and respiratory rate, pulse oximetry and signs of respiratory distress). 2. Data collection about MV: Chronological age at start of MV, duration of MV, number of re-intubations, ventilator modes, settings including peak inspiratory pressure (PIP), positive end expiratory pressure (PEEP), fraction of inspired oxygen (FIO2), feeding on MV whether nasogastric tubal feeding NGT or total parenteral nutrition (TPN), insertion of umbilical vein catheter (UVC). 3. Investigations: This was done at the time of initiation of MV and repeated when VAP was suspected. • Complete blood count (CBC) especially Total Leucocytic Count (T.L.C), Differential Leucocytic Count (D.L.C), band forms of white blood cells and immature to total leucocytic count). • Arterial blood gases (ABG). • Blood culture and sensitivity. • Non- bronchoscopic broncho alveolar lavage (NB-BAL) culture and sensitivity. 1. If neonate was inter breathing or fighting on the ventilator, sedation was required. 2. Pre-oxygenation by increasing FIO2 just before procedure. 3. Positioning: Supine with the head turned 900 to the left to ensure that the suction catheter can advance down through trachea to enter the right main bronchus. 4. A complete clinical examination and chest radiograph were performed one hour after completion of sampling. For 3.5 mm endotracheal tube(ETT), 8F sized end hole suction catheter which was filled with sterile water and connected to a low pressure suction device (6F sized catheter can be used for 3 mm or smaller size ETT). The ETT was disconnected from ventilator circuit (VC) and 0.5-1 ml sterile water was directly injected in the tube via a sterile disposable syringe for lavage. The suction catheter was then advanced immediately into the ETT until 1cm beyond the tube tip, to suction back the sterile water from the lower airways. The obtained fluid was immediately sent to the clinical pathology and microbiology laboratory of TUH. 1. Macroscopic examination: The appearance, volume, color, consistency and aspect. • The number of white blood cells was estimated. • A film stained with Leishman stain was done to determine the predominant type of cells. • Another film stained with Gram stain was done to determine the presence of organisms. • A blood agar plate (sheep RBCs 5-10%) incubated for 48 hours at 37°C under anaerobic conditions. • Chocolate agar plate incubated for 48 hours at 37°C in CO2 enriched atmosphere. • Mac Conkey agar plate incubated for 48 hours at 37°C under aerobic condition. 4. The species and strain of bacteria were identified and the most effective antibiotic drugs at inhibiting their growth were determined. 3b) Chest radiography (Plan X-ray anterposterior and lateral views): On admission and repeated as required. The collected data were tabulated and analyzed using SPSS version 20. Categorical data were presented as number and percentages while quantitative data were expressed as mean ± standard deviation and range. Chi square test (X2), Fisher's exact test (F) and Receiver Operating Characteristic (ROC) curve. The accepted level of significance in this work was stated at 0.05 . P value >0.05 is non-significant (NS). P<0.05 is significant (S). P ≤ 0.001 is highly significant (HS). Table 1 summarized demographic and laboratory data of studied patients and controls. Table 2 compare between studied groups as regarding the need for resuscitation measures at birth. Table 3 compared between different studied groups as regarding diagnosis at admission. Table 4 compared between studied patients as regarding risk factor for VAP. There is significant increase in duration on mechanical ventilation in late full term when compared to early full term subgroups (p<0.05). Respiratory acidosis was the commonest finding in preterm group, while metabolic acidosis was the commonest finding in full term group (P<0.05). Mortality rate was higher in early onset VAP in preterm group (13.3%) than in other patient groups (6.7%). Table 5 summarized laboratory data of studied groups. There is significant decrease in I/T ratio in PT group than FT group than controls (P<0.05). Table 6 and Figure 1 compared between studied patients as regard causative organism according to blood culture. 75% of patients in studied groups showed negative blood culture. The commonest organism detected in blood culture in early onset VAP in preterm subgroups was E. coli and S. aureus (13.3%). Table 7 and Figure 2 compared between studied patients as regard sensitivity of blood culture to antibiotics showing that E. coli is most sensitive to Meropenam (75%), Pseudomonas to Meropenam also (100%), Klebsiella pneumonie to Amikacin, Meropenam and Levofloxacin (33.3%), Staphylococcus aureus to vancomycin (80%), Streptocoocus viridans is to azithromycin (100%). Table 8 and Figure 3 compared between studied patients regarding causative organism by BAL culture. The commonest organism detected in NB-BAL culture in early and late onset VAP in preterm subgroups was Klebsiella pneumonie (40%). Table 1. Demographic and laboratory data of studied patients and controls. Table 2. Comparison between studied groups as regarding the need for resuscitation measures at birth. Table 3. Comparison between studied groups as regarding diagnosis at admission. Note: RDS (respiratory distress syndrome), CHD (congenital heart disease), IDM (infant of diabetic mother), TTN (transient tachypnea of newborn), HIE (hypoxic ischemic encephalopathy). Table 4. Comparison between studied patients as regarding risk factor for VAP. P value: probability between preterm and full term groups, P1 value: probability between early and late preterm subgroups, P2 value: probability between early and late full-term subgroups. Table 5. Laboratory data of studied groups. P value: probability between preterm and full term groups. P1 value: probability between early and late preterm subgroups. P2 value: probability between early and late full-term subgroups. TLC (Total leucocytic count), IT ratio (immature/total neutrophil ratio) HCT (hematocrit value), CRP(C - reactive protein). Table 6. Comparison between studied patients as regarding bacteriological results of blood culture (causative organism). Table 7. Comparison between studied patients as regarding bacteriological results of blood culture (sensitivity to antibiotics). Table 8. Comparison between studied patients as regarding bacteriological results of BAL culture (causative organism). Figure 1: Distribution of causative organisms among studied patients according to blood culture results. 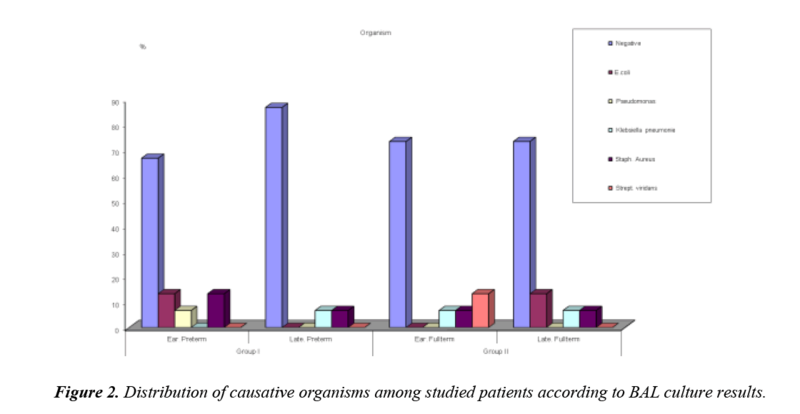 Figure 2: Distribution of causative organisms among studied patients according to BAL culture results. 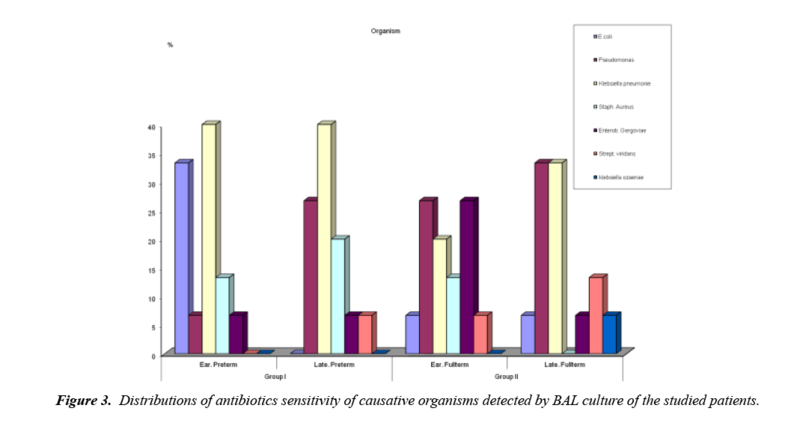 Figure 3: Distributions of antibiotics sensitivity of causative organisms detected by BAL culture of the studied patients. Table 9 and Figure 4 compared between studied patients as regard causative organism by BAL culture showing that E. coli is most sensitive to ciprofloxacin (42.9%), Pseudomonas to tazobactam (42.9%), Klebsiella pneumonie to gentamycin (45%), Staphylococcus aureus to vancomycin (57.1%), Enterobacter gergoviae to amikacin (42.9%) and gentamycin (42.9%), Streptocoocus viridans to azithromycin (100%) and Klebsiella ozaenae to gentamycin (100%). Tables 10 and 11 summarized relation of data of mechanical ventilation to causative organisms of VAP by BAL culture in studied preterm and full term group and Table 12 summarized adjusted odds ratio of the studied patients. There is no significant relation between number of reintubation, mechanical ventilator duration, modes or settings and causative organisms of VAP in studied preterm or full-term group (P>0.05). Table 13 and Figures 5 and 6 compared validity of BAL culture to that of blood culture for diagnosis of VAP in the studied patients groups and reported that NB-BAL culture in preterm studied group has higher sensitivity (75% vs. 46%) and specificity (71% vs. 57%) than blood culture and reported that NB-BAL culture in full-term studied group also has higher sensitivity (80% vs. 53%) and specificity (72% vs. 55%). Figure 4: Distributions of antibiotics sensitivity of causative organisms detected by blood culture of the studied patients. 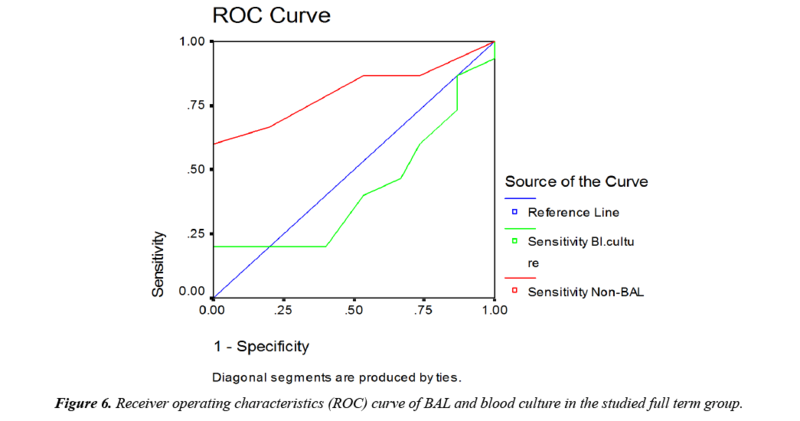 Figure 5: Receiver operating characteristics (ROC) curve of BAL and blood culture in the studied preterm group. 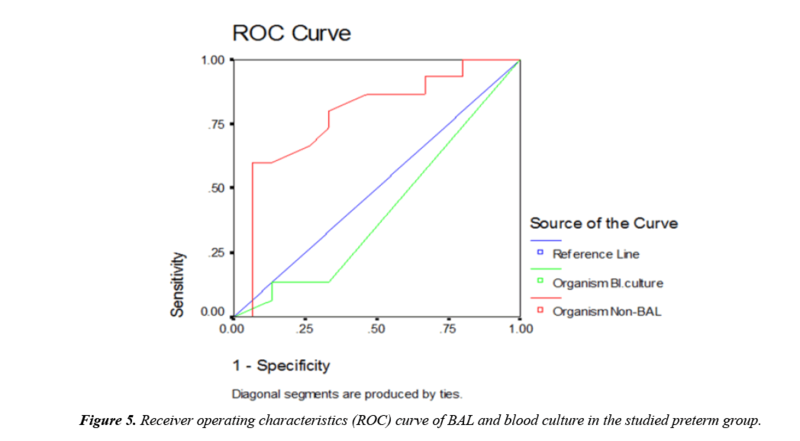 Figure 6: Receiver operating characteristics (ROC) curve of BAL and blood culture in the studied full term group. Table 9. Comparison between studied patients as regarding bacteriological results of BAL culture (sensitivity to antibiotics). Table 10. Relation of data of mechanical ventilation to causative organism of VAP (BAL culture) in studied preterm group. Table 11. Relation of data of mechanical ventilation to causative organism of VAP (BAL culture) in studied full term group. Table 12. Adjusted odds ratio of the studied patients. Full term group 95.0% C.I. Pre term group 95.0% C.I. Table 13. Validity of non bronchoscopic bronchoalveolar (Non-BAL) lavage and blood culture for diagnosis of VAP in the studied patients groups. Unfortunately MV is associated with a substantial risk of VAP with high mortality rate [12-14]. The etiological diagnosis of VAP is more valuable than clinical and radiological diagnosis for accurate management. Hence, defining the infective organism helps modifying the initial antibiotics according to the culture and sensitivity tests and so preventing the emergence of resistant strains. Subsequently, the duration of ventilation, length of NICU stay and hospital expenses are markedly decreased. Non Bronchoscopic Broncho alveolar lavage (NB-BAL) is used in neonates as it is a safe with few adverse effects . Our study was in agreement with previously published demographic data for VAP. For examples, Afjeh et al. who reported no difference regarding gender in neonates who developed VAP , Tripathi et al. who reported that there is no statistical significant association between VAP and mode of delivery , Zhu et al. who found an inverse relation between weight and liability to VAP  and Petadachai and Foglia et al. who reported that VAP incidence rates had significantly increased with decreasing gestational age [19,20]. In our study, there is significance increase in need of resuscitation at birth in patients when compared to controls and this disagree with Tripathi et al. who reported that no relation between resuscitation at birth and VAP . The most common diagnosis at diagnosis in our study was respiratory distress syndrome in preterm group (early onset VAP 53.3%, late onset VAP 80%), congenital heart disease in full-term group diagnosed as early onset VAP (40%), hypoxic ischemic encephalopathy (33.3%) in full-term group diagnosed as late onset VAP and transient tachypnea of newborn in control group without VAP and this agrees with other investigators . In our study, there is no significant differences between studied groups as regarding postnatal age at time of starting mechanical ventilation and this agree with Yuan et al. who reported that no relation between postnatal age of starting mechanical ventilation and development of VAP . In our study, there is no significant differences between preterm and full term studied group as regarding feeding type (either enteral feeding by nasogastric tube (NGT) or total parenteral nutrition (TPN). This result is not in accordance with Marc et al. who reported that parenteral nutrition is associated with higher risks of developing intravascular device associated infections, complications of line insertion, higher costs, and loss of intestinal villous architecture, which may facilitate microbial translocation . Our study disagreed also with Garcia, who reported that enteral nutrition given by nasogastric tube is also associated with increased risk of VAP . On the other hand, Marc et al. advised to feed critically ill patients enterally as early as possible for many benefits without hazards of risk for VAP and this agree with our study as regarding patients who received enteral feeding given by NGT . In our study, there is no significant differences between studied patients as regarding application of umbilical venous catheter (UVC) as invasive maneuver and this result disagrees with Van der kooi et al. who reported that the placement of umbilical venous catheter was the major risk for acquiring VAP in their studied patients as they are considered an important source of blood stream infection . Our results agree with Apisarnthanarak et al. who reported that the presence of (UVC) may be just a marker for the severity of illness and not risk factor for VAP . In our study, there is significant increase in duration on mechanical ventilation in late onset VAP in FT group when compared to early onset group. These results are near the result of Tripathi et al. . This result may be explained by the fact that VAP leads to difficult extubation and increase period of ventilation with increased risk of recurrence due to increases the risk of infection secondary to the exposure to humidifiers, nebulizers and ventilator circuits that are proven to be important source and medium for microorganisms . In our study, there is no significant differences between all studied patients diagnosed as VAP as regarding number of reintubation and this disagree with Tripathi et al. and Yuan et al. who reported increased risk of VAP with increased frequency of re-intubation and endotracheal suctioning [17,22]. In our study, there are no significant differences between all studied patients diagnosed as VAP and mode of mechanical ventilation and this agree with Claure and Bancalari, who report that no direct relation between acquired nosocomial pneumonia and mode of ventilator . They also reported that new modes of mechanical ventilation facilitated weaning and led to shorter duration on mechanical ventilation and so decrease risk of VAP (indirect relation between VAP and new mode of ventilation) . In our study, there no significant differences between all studied patients diagnosed as VAP as regarding ventilator settings (P>0.05) and this agree with Courtney et al, who reported no direct relation between ventilator settings and nosocomial acquired pneumonia in preterm and full-term neonates diagnosed as VAP and reported that VAP leads to increasing in ventilator settings with difficulty extubation and this agree with our study where the means of different parameters of ventilator settings used in our study were high . As regarding arterial blood gases at initiation of ventilation, there is significant difference in acid base state between preterm group diagnosed as VAP and full term group diagnosed as VAP and this can be explained by various and different pathology at time of ventilation and this agree with Deorari and Paul . By analysis of ABG between all groups in our study, we noticed that the respiratory acidosis is the predominate in early and late onset VAP in preterm groups and this agree with common pathology at admission which was RDS which lead to worsening of ventilation and this agree with Bozaykut A et al. . The majority in early and late onset VAP in full term group is metabolic acidosis and this agree with common pathology at admission which was CHD and HIE and this also agree with Bozaykut A et al. . The cause of low mortality rate in our study (5.6% of studied patients) was due to defining infective organism causing VAP which improve prognosis and decrease mortality rate and this previously reported by Kksal et al. who had results in accordance with our results . This disagrees with Hentschel et al. who found mortality rate in their study ranged from 20- 70%. This may be due to different facilities and environmental circumstances . In our study, chest radiographs were diagnostic in (100%) of the cases clinically diagnosed as VAP in the form of pneumonic patches and this agree with Elward et al. . In our study there is no differences between studied groups diagnosed as VAP as regarding which lobe show pneumonic patches by chest radiographs and this agree with Saldanha et al. who reported that any lobe or lobule of the lung can be affected by VAP and this depended on virulence of the causative microorganisms, general condition of the affected neonate and presence of underlying lung pathology . In our study, NB-BAL culture reported that gram negative bacteria were isolated from the majority of babies (81.6%), with Klebsiella predominating the positive culture (33.3%). On the other hand gram positive infection comprised (18.4%) of the total cultures with Staphylococcus aureus predominating (11.7%). Our results was similar to Apisarnthanarak, and Zhu et al. who mentioned that there are predominance of gram negative bacteria in their units [18,26]. In our study, there is no statistically significant difference in total leucocytic count (TLC) and C-reactive protein (CRP) level between studied VAP group and non VAP group and this agree with Afify et al. and this can be explained by the fact that TLC and CRP level can be affected by any infectious or inflammatory focus and not specific for VAP . On the other hand, Povoa et al. mentioned that decreasing CRP level precede clinical improvement, whereas, conversely, failure of CRP level to fall suggests infectious complication, ineffective or inappropriate treatment . In our study, there is statistically significant increase in immature neutrophil/ total neutrophil ratio (I/T ratio) in patients when compared to controls and this agrees with Garland, who considers I/T ratio more than 0.1 is one of criteria for diagnosis of VAP and this near mean of I/T ratio in our study . Regarding hematocrit in our study, there is significant increase in preterm and full-term groups when compared with controls and this was previously explained by Demetrian et al. who said that the hematocrit is generally kept at higher than physiologic values for ill neonate . Regarding the blood culture in our study, three quarters of studied neonates showed no growth, equal results between gram negative (E. coli, Klebsiella pneumonie and Pseudomonas) and gram positive (Staphylococcus aureus and Streptococcus viridans ) organisms. This is not in agreement with Zhu et al. and Yuan et al. who reported that gram negative bacilli was the higher than gram positive coccus in their VAP patients [18,22]. This can be explained by the fact that the distribution of microorganisms differs from NICU to another according to infection control facilities and also differs within the same place from one period of time to another . In our study, the most common organism detected in NBBAL culture in early and late onset VAP in preterm group was Klebsiella pneumoie and this agree with Apisarnthanarak, who reported the same organism . On the other hand, the most common organism detected in NB-BAL culture in early and late onset VAP in full-term group was pseudomonas and this agree with Petdachai et al. . Culture results have currently great benefits as they used to guide adjustment or withdrawal of antibiotic therapy [36,39,40]. The results of sensitivity of microorganism to antibiotics differs from unit to another according to various factors mainly resistance of microorganisms to antibiotics and degree of application of aseptic measures so it is difficult to compare results in our study with other researches in different communities . Sensitivity of microorganisms by BAL culture to antibiotic in our study differ from that of blood culture which agreed with Zhu et al., that reported that none of the studied neonates who developed VAP had the same organism that causes their blood stream infection . However this disagrees with Bozaykut et al., who reported that pathogens isolated from blood were comparable with the organisms isolated from the endotracheal aspirate . In our study, there is no relation between data of mechanical ventilation and causative organisms and this agree with Courtney et al. and Claure and Bancalari, who attributed these results to presence of other important risk factors for VAP such as improper infection control strategies [27,28]. In our study, we concluded that BAL culture in both preterm and full term neonates has higher sensitivity and specificity when compared to blood culture. Our results are near the results of Burmester and Mok  and with Grossman and Fein . VAP was common in both preterm and full term Egyptian neonates. Prolonged duration on mechanical ventilation was the commonest risk factor. BAL culture was positive in 100% of studied patients while blood culture was positive only in 25% of them with no significant similarity between the causative organisms in blood and BAL culture where the commonest isolated organism from BAL culture was Klebsiella pneumonie which was highly sensitive to gentamycin. BAL culture was more sensitive and specific than blood culture in diagnosis of neonatal VAP in both preterm and full term neonates. BAL culture helped early adequate diagnosis thus providing a better outcome of VAP. Mortality rate was higher in early onset preterm neonates than in other subgroups. In mechanically ventilated neonates (especially preterm), we recommend strict application of infection control program, avoidance of unnecessary endotracheal intubations and reduction of duration on MV in NICU to help prevention of VAP. BAL culture should be taken without delay once VAP is suspected. Routine empirical fixed antibiotic are inadvisable. If culture results are pending, the choice of early appropriate antimicrobial agents should depends on local prevalence of the pathogenic agents, antimicrobial resistance patterns, and patient specific factors. Empirical antibiotic should be selected from a different class than antibiotics that neonates have recently received with judicious use of combination therapy. Empirical antibiotics should be de-escalated to specific antimicrobial therapy according to BAL culture results. Discontinuation of antibiotics is recommended if VAP is no longer suspected. I would like to thank my colleagues in NICU of TUH and BUH and parents of my patients and controls for their wonderful collaboration. Duke T. Neonatal pneumonia in developing countries. Arch Dis Child Fetal Neonatal. 2005;90:F211. Nissen MD. Congenital and neonatal pneumonia. Paediatr Respir Rev. 2007;8(3):195-203. Pegues DA, Arathoon EG, Samayoa B. Epidemic gram-negative bacteraemia in a neonatal unit in Guatemala. Am J Infect Control. 1998;22:163-71. Webber S, Wilkinson AR, Lindsell D. Neonatal pneumonia. Arch Dis Child. 1997;65:207-211. Shakunthala SKV, Rao GM, Urmila S. Diagnostic lung puncture aspiration in acute pneumonia of newborn. Indian Pediatr. 1998;15:39-4. Lehmann DE, Heywood P. Effect of birthweight on pneumonia-specific and total mortality among infants in the highlands of Papua New Guinea. P N G Med J. 1996;39:274-83. Leone M, Garcin F, Bouvenot J. Ventilator associatated pneumonia breaking the vicious circle of antibiotic overuse. Crit Care Med. 2005;33:379 -385. Chastre J, Fagon JY. Ventilator associated pneumonia. Am J Respir Crit Care Med. 2002;165:876-903. Coffin S, Klompas M, Classen D. Strategies to prevent ventilator-associated pneumonia in acute care hospitals. Infec Control and Hosp Epidemiol. 2008;29:S31–S40. National Nosocomial Infections Surveillance System. National Nosocomial Infections Surveillance (NNIS) system report, data summary from January 1992 through June 2004, issued October 2004. Am J Infect Control. 2004;32:470–85. Khothari CR. Research methodology, methods and techniques. New Age International, New Delhi. 2012;95‑7. Aly H, Badawy M, El-Kholy A. Randomized, controlled trial on tracheal colonization of ventilated infants: can gravity prevent ventilator-associated pneumonia? Pediatrics. 2008;122:77–774. Rebmann T, Linda GR. Preventing ventilator-associated pneumonia: An executive summary of the Association for Professionals in Infection Control and Epidemiology, Inc, Elimination Guide. J Infect Control. 2010;38:647-649. Melsen WG, Rovers MM, Koeman M. Estimating the attributable mortality of ventilator-associated pneumonia from randomized prevention studies. Crit Care Med. 2011;39(12):2736-42. Kksal E, Oglu MH, Elebi S. Non bronchoscopicbroncho-alveolar lavage for diagnosing ventilator associated pneumonia in newborns. Turk J Pediatr. 2006;48(3):213-220. Afjeh SA, Sabzehei MK, Karimi A. Surveillance of ventilator-associated pneumonia in a neonatal intensive care unit: characteristics, risk factors, and outcome. Arch Iran Med. 2012;15(9):568 – 571. Tripathi S, Malik GK, Jain A. Study of ventilator associated pneumonia in neonatal intensive care units: characteristics, risk factors and outcome. Internet J Med Uptodate. 2009;5:12-19. Zhu XL, Zhao L, Yang JC. Etiology and high risk factors of neonatal ventilator associated pneumonia. Zhongguo Dang Dai ErKeZaZhi. 2007;9(6):549-52. Petdachai W. Ventilator associated pneumonia in newborn intensive care unit in Prachomklao Hospital Thailand. Southeast Asian Trop Med Pub Health J. 2004;3:724-729. Foglia E, Meier MD, Elward A. Ventilator associated pneumonia in neonatal and pediatric intensive care unit patients. Clin Microbiol Rev. 2007;20(3):409-25. Badr MA, Ali YF, Albanna EAM. Ventilator associated pneumonia in critically ill neonates admitted in NICU, Zagazig university hospitals. Iran Pediat J. 2011;21:418-424. Yuan TM, Chen LH, Yu H. Risk factors and outcomes for ventilator- associated pneumonia in neonatal intensive care unit patients. J Perinat Med. 2007;35:334-8. Marc JM, Kottef MF, Hall JB. Risk factors for ventilator associated pneumonia: From Epidemiology to patient management. Clinical Infectious Diseases. 2004;38:1141-9. Garcia R. A review of the possible role of oral and dental colonization on the occurrence of health care-associated pneumonia: Underappreciated risk and a call for interventions. Am J Infect Control. 2005;33:527–541. Van der kooi Ti, de Boer AS, Mannien J. Incidence and risk factors of device- associated infections and associated mortility at the intensive care in Dutch surveillance system. Intensive Care Med. 2007;33(2):271-8. Apisarnthanarak A, Pazgal G, Hamvas A. Ventilator associated pneumonia in extremely preterm neonates in neonatal intensive care unit: characteristics, risk factors and outcomes. Pediatrics. 2003;112(6):1283-1289. Claure N, Bancalari E. New modes of mechanical ventilation in the preterm newborn: evidence of benefit. Arch Dis Child Fetal Neonatal Ed. 2007;92(6):F508-12. Courtney SE, Durand DJ, Asselin JM. Neonatal ventilation study group: High-frequency oscillatory ventilation versus conventional mechanical ventilation for very-low birth-weight infants. N Engl J Med. 2002;347(9):643-52. Deorari AK, Paul VK. Symposium on AllMS (All India Institutes of Medical Sciences) protocols in neonatology. Indian J Pediatr. 2008;55. Bozaykut A, Ipek IO, Kilic BD. Predicting neonatal sepsis in ventilated neonates. Indian J Pediatr. 2008;75(1):39-42. Hentschel J, Brungger B, Studi K. Prospective surveillance of nosocomial infections in a Swiss NICU: Low risk of pneumonia on nasal continuous positive airway pressure. Infection 2005;33:350–5. Elward AM, Warren DK, Fraser VJ. Ventilator associated pneumonia in pediatric intensive care unit patients: Risk factors and outcomes. Pediatrics. 2002;109(5):758-764. Saldanha Dominic RM, Prashanth HV. A clinico-microbiological study of ventilator-associated pneumonia in a tertiary care hospital. Int J Biol Med Res. 2012;3(2):1651-1654. Afify M, AI-Zahrani S, Nouh MA. Risk factors for the development of ventilator associated pneumonia in critically-ill neonates. Life Science Journal. 2010;9(1):302-307. Povoa P, Coelho L, Almeida E. C-reactive protien as a marker for infection in critically patients. Clinical Microbiol Infect J. 2005;11:101-8. Garland JS. Strategies to prevent ventilator-associated pneumonia in neonates. Clin Perinatol. 2010;37(3):629-43. Demetrian M, Stoicescu S, Llie C. Clinical assessment in neonate transfusion guidelines. Jurnalul Pediatrului. 2014;65-66. Shaw MJ. Ventilator associated pneumonia. Opin Pulm Med. 2005;11(3):236- 241. Baltimore RS. The difficulty of diagnosing ventilator associated pneumonia. Pediatrics. 2003;112:1420-1421. Siempos LL, Kopterides P, Maniatis NA. Protective role of strains against ventilator –induced lung injury. Crit Care. 2010;14(5):441. Burmester M, Mok Q. How safe is non-bronchoscopic broncho alveolar lavage in critically ill mechanically ventilated children? Intensive Care Med. 2001;2:716-721. Grossman RF, Fein A. Evidence based assessment of diagnostic tests for ventilator associated pneumonia. Chest. 2000;117:177S-181.